I hope you enjoy this. It is quite a lovely building. One feature that I particularly like is all the gargoyles. I don't believe you can see them in the picture. Maybe you will find an opportunity to visit Saginaw and see it for yourself. I found a website that provided some historical information on the Saginaw Castle. "The Castle Museum was built in 1897 as a post office through a program which was designed to make government buildings reflect the history of the town in which it was built. 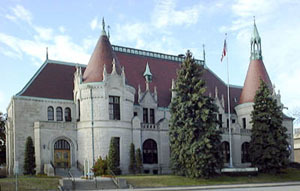 Saginaw was first settled by the French Voyageurs so the building was made to look like a French Chateau. The project was very costly so the government scrapped the program after the first building was complete." A special thanks to Paula Weed for sending this in.